Plus learn to play Pearl Jam, Metallica, Pink Floyd and more! Total Guitar issue 235 is on sale in print in the UK and digitally worldwide via Newsstand for iPad, iPhone and iPod Touch from today! 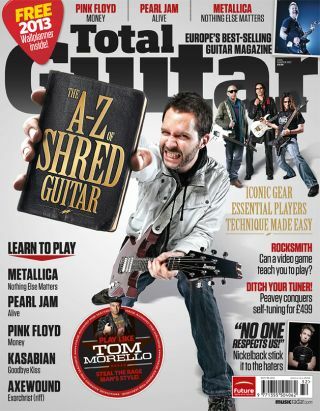 Total Guitar issue 235 is on sale in print in the UK, and digitally worldwide right now! This month, our cover feature explores the world of shred, taking in the players, gear and techniques that have become cornerstones of the genre. There's a ton of stuff to learn, as we breakdown the key techniques in an easy to understand way, complete with tab and audio for you to play along with. Chad and Ryan stick it to the haters! Peavey, Laney, PRS, VOX, Sterling and more!